We will respond 100% to messages within 3 to 4 business hrs! COVERS in Play has created the most advanced architectural product of its kind. Fully automatic, retractable pool enclosures that opens and closes with the push of button that are designed and manufactured in Canada. 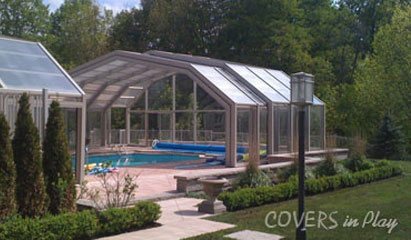 Imagine designing your own back yard oasis using COVERS in Play's automatic retractable pool enclosure system to protect your pool and patio area in bad weather and even allow you to enjoy year round use of the area during the worst winters. Bring your outdoor pool indoors, also known as indoor outdoor pool. COVERS in Play can handle all the details. Engineering to building code requirements, drawings and permit submissions, construction and installation on site – COVERS in Play has you covered. And made to last. Check our warranty – unsurpassed in the industry. 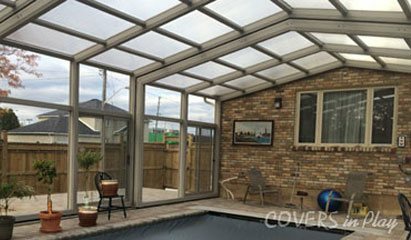 Call us at 905-589-3000 or email at info@coversinplay.ca for more information on our outdoor swimming pool enclosures or patio enclosures in Canada. What is an Automatic Retractable Pool Enclosure? COVERS in Play takes the concept to the highest level. The System is designed to allow the outdoor swimming pool enclosures to be opened to natural sunlight and fresh air with the push of a button. It can be made with any number of telescoping bays, sliding under or over one another, toward one end or both ends, if desired. 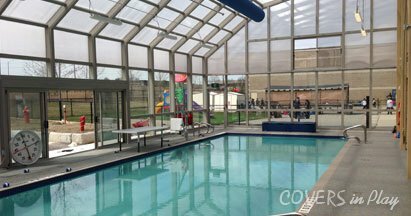 A winter pool enclosure can be built to attach to a building or made to be free standing. Lean to style as well. Fixed or operable. Each project is built to the building code requirements of the installation site, assuring a lifetime of serviceable use. Can I really use my swimming pool all year? Yes you can. Most inground swimming pool enclosures, sunrooms, patio enclosures, pool domes and pool covers collapse in heavy snow or winds, and their warranties even advise against it. But COVERS in Play's patented framing system is designed and built for the heaviest of snowloads and all Building Code requirements of the installation site. No snow removal is required. See the photos in our gallery. Where can a Telescopic Pool Enclosure be installed? The COVERS in Play enclosure system is useful in so many ways. If you can imagine it, Cover in Play can make it happen. Residential swimming pools, indoor pools, pool shelters, swim spa, sunrooms, patios, commercial applications like restaurants, roof top terraces, balcony enclosures, outdoor event areas, like weddings etc., outdoor sales area like florists and garden centers, the list goes on. If you can image it, COVERS in Play can make it happen. Tired of manually handling that old pool blanket? Looking for a retractable pool cover? Check out our new Auto Pool Reel. It's electric. It's automatic. It pushes the thermal blanket or solar pool cover out on the water with the push of a button. And it brings it back off the water the same way. With the push of a button. Like magic. It's done. No more sweating, swearing or needing 2 people. No more straightening, pushing or tugging. No more yelling. It's easy. With our features you can enjoy your outdoor pool anytime and swim year round! The Single Peak roof profile is technically known as a "Gable Roof" design architecturally. It consists of a single sloping surface on each side of a central ridge at the top of the roof. The symmetrical design easily sheds snow and rainwater and compliments many architectural building styles. It is most suited to narrower spans but is also available up to 50 feet wide or more, depending on the snow loads and site conditions. All of the COVERS in Play enclosure systems are specifically engineered to meet building code requirements for each installation site and are warrantied against failure. As a fixed structure with various fenestration options or operable, opening to each end or all one way, a Single Peak enclosure is a practical, economical solution for protecting your outdoor environment and allowing for year round use of the area. Lean-to enclosures are a simple solution for a tight space constraint. Turn your pool or patio parallel with the building or house wall and let COVERS in Play enclose the area. The clean straight line appearance of the single peak roof profile offers a low 12 degree pitch allowing for installations in otherwise hard to deal with situations. The enclosure can be designed to open from the center or over the end bays if desired, or to move all to one side, with the inclusion of bifolding doors in one endwall. Or, a fixed structure could be built with any number of man doors, sliding doors and windows with flyscreens for abundant fresh air and ventilation. The Triple Peak roof profile is technically known as a gambrel roof. It has two angled slopes on both sides of a central ridge and has a pleasing architectural appeal. Apart from adding more height and headroom at the wall interfaces, it lends itself to more structural strength, allowing for wider spans without supporting columns. The system is designed with various thicknesses of rafter to accommodate any structures inside the enclosures like water slides, fountains, or any other height requirements. With telescoping bays, the heights can be higher at one end and lower at the other. 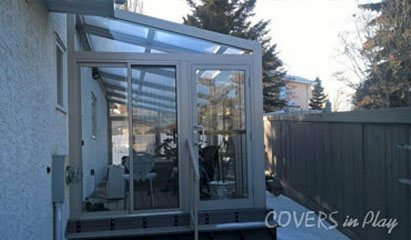 Made as a fixed enclosure, the system is a consistent height throughout and can have number of man doors, sliding door bifolds, or windows as may be desired. Lean-To enclosures offer a unique opportunity to keep the covered pool or patio area closer to the house and therefore allow for easier direct access and use in more confined space. The triple peak roof profile allows for a higher overall roof heights and a wider footprint out from the main building wall on which it is mounted. The unique gambrel style offers a practical space solution and an unequalled visual effect. The system can be made operable, opening from the center outwardly, towards the ends or made to slide all one way, with the inclusion of bifolding doors at one end. It can also be made more economically as a fixed structure with several sliding door for ventilation and access/egress. Amazing architectural affects can be achieved with COVERS in Play glazed roofing systems. Fully operable roofs can be made to open partially or clear an entire roof opening if desired Practically any size can be accommodated and with varying curb heights and roof profiles. Roofs can be fixed and completely airtight as with any fixed skylite and therefore entirely suitable for cathedral type ceilings or any other application to allow for brighter daylight effect. The Single Peak roof profile is technically known as a "Gable Roof" design architecturally. It consists of a single sloping surface on each side of a central ridge at the top of the roof. The symmetrical design easily sheds snow and rainwater and compliments many architectural building styles. It is most suited to narrower spans but is also available up to 50 feet wide or more, depending on the snow loads and site conditions. 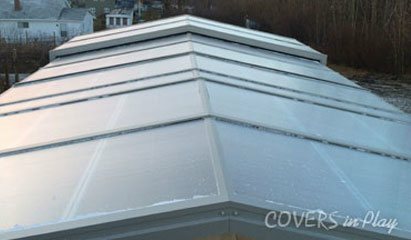 All of the COVERS in Play enclosure systems are specifically engineered to meet building code requirements for each installation site and are warrantied against failure. As a fixed structure with various fenestration options or operable, opening to each end or all one way, a Single Peak enclosure is a practical , economical solution for protecting your outdoor environment and allowing for year round use of the area. Auto Pool Reel - the only automatic cover system that operates itself. At the push of a button! COVERS in Play now introduces the new Auto Pool Reel, retractable pool cover. Keep that heat in. Keep evaporation down. The Auto Pool Reel lets you cover and uncover your pool water with ease. And it minimizes chemical use too. No more struggle, with two people, or manually tugging with ropes or winding up a roller. The Automatic Pool Cover is the answer. On and off as many times a day as you need. No effort, no strain, no worries. Auto Pool Reel. COVERS in Play automatic pool covers now eliminate the hassle, the pain and manual effort of uncovering or covering your pool. The only way until now for swimming pool covers was a manual system an expensive on deck or built in system. But now, COVERS in Play Auto Pool Reel is as convenient as pushing a button. The Simple Touch Deployment System is revolutionary. Completely hands free, trackless, self deploying and retracting with no pulling, no cranking, no manual labor, no cables, no strings. This patented system allows for push button convenience. Get yours today at www.autopoolreel.com. www.autopoolreel.com.